It’s a $150 Billion industry, promising people everything from perfect abs to the Perfect Pancake. Two minutes or less of carefully-crafted commerce aimed solely at making you buy, and buy NOW! A 25-year-old industry whose sales are increasing, despite today’s turbulent economy. CNBC Emmy-nominated Sports Business Reporter Darren Rovell goes inside the big business of direct-response infomercials that’s made the Snuggie, ShamWow! and the Ginsu Knife household names. Rovell sits down with the industry heavyweights like inventor Ron Popeil, pitch man Billy Mays and Telebrands CEO AJ Khubani, tests which products are busts or buys, and uncovers the psychology behind why some sales pitches strikeout while others are hit out of the park. “As Seen On TV” airs Wednesday April 22 at 9pm ET/6pm PT and again at 1am ET/10pm PT. 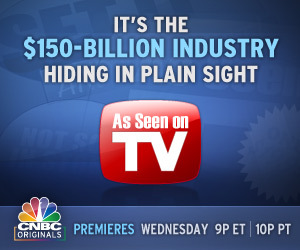 Get more info from the CNBC website. I saw “As Seen On TV” and found it interesting. When Billy Mays isn’t on television pitching products his voice is rather quiet and subdued.